Even if people aren’t a fan of science fiction, chances are they have heard of this book or seen the 1954 Disney movie version. 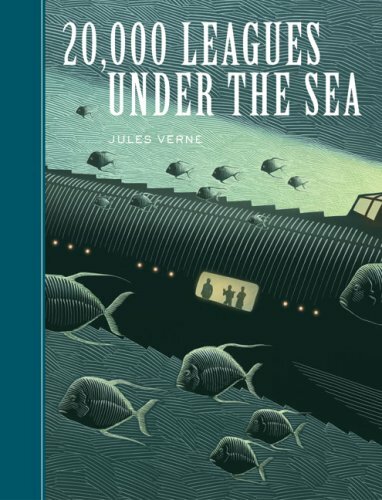 If you read my review of Around the World in 80 Days, you know I am only lukewarm on Jules Verne’s writing style, but I’ve read a few different Steampunk books that use Captain Nemo as a character, so I wanted to go back to the original source to learn a bit more. It all begins with the mysterious disappearances of various vessels in 1866. Many believe a giant sea creature is behind the attacks, and the narrator, a French marine biologist named Pierre Aronnax, is enlisted to aid in the search while visiting New York. He departs from the United States along with his faithful manservant, Conseil, and together they join a team of explorers including a Canadian harpooner named Ned Land. 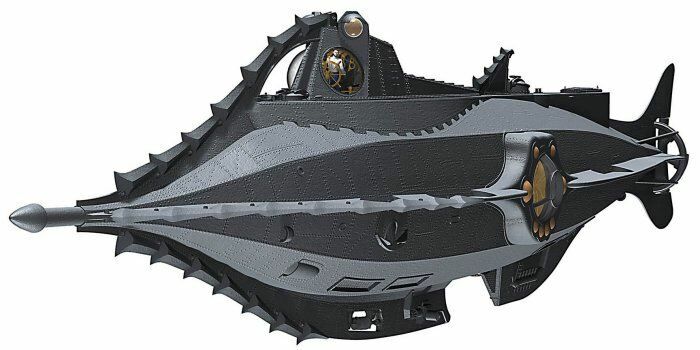 Shortly after setting out, the intrepid team encounters the creature, only to find it is in fact an incredibly advance submarine captained by one of the most famous figures in all of Steampunk literature, Captain Nemo. The rest of the story details the journey of Aronnax, Conseil and Land as they criss-cross the globe as Nemo’s prisoners. 20,000 Leagues Under the Sea was incredibly well-researched. I used to work at an aquarium, so I probably was able to get a bit more out of it than the average reader, because the narrator, Aronnax, goes into exhaustive detail about the different marine animals he encounters while traveling the seven seas with Nemo. I would like to read it again some day, but this time I would make sure to find an illustrated version. When the story was originally published as a serial in Magasin d’Éducation et de Récréation from 1869-1870 it did not include any illustrations, but since it was compiled as a novel a few years later there have been several illustrated and even a graphic novel version of the tale. But, this meticulous detail can also be a drag. The Mister and I read this one out loud as we often do with the books I review, and even though I have my science background and he is a Roman historian, we both stumbled over the multitude of Latin names. Though of course it makes sense to use the proper scientific names of species, both for clarity and because the narrator is a marine biologist, it can make the actual reading a bit tedious. We were about halfway through when my brain was just begging for a giant squid to attack. This bit of action comes very late in the book, and gets a lot more attention in movie adaptations than Verne gave it in the text. Unlike Around the World in 80 Days, where the indefatigable Passepartout can offer a respite from the monotony of travel, there is no comedic relief in 20,000 Leagues. Nemo is an interesting and enigmatic character to be sure, but I think overall it makes for pretty dry reading. The science in this book is sound, so it holds up to time better than Journey to the Center of the Earth, but for me it wasn’t really entertaining enough for the slog through over 300 pages.